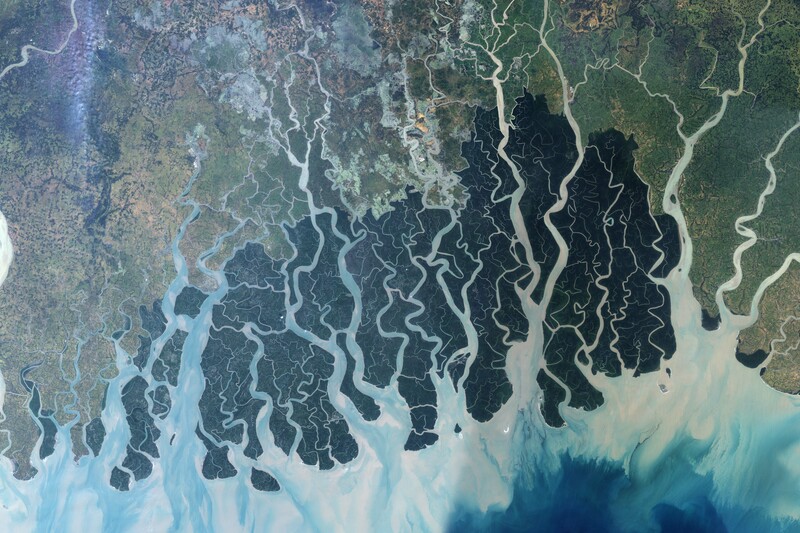 Stretching across part of southwestern Bangladesh and southeastern India, the Sundarbans is the largest remaining tract of mangrove forest in the world. The Sundarbans is a tapestry of waterways, mudflats, and forested islands at the edge of the Bay of Bengal. Home to the endangered Bengal tiger, sharks, crocodiles, and freshwater dolphins, as well as nearly two hundred bird species, this low-lying plain is part of the Mouths of the Ganges. The area has been protected for decades by the two countries as a National Park, despite the large human populations concentrated to the north. This satellite image shows the forest in the protected area. The Sundarbans appears deep green, surrounded to the north by a landscape of agricultural lands, which appear lighter green, towns, which appear tan, and streams, which are blue. Ponds for shrimp aquaculture, especially in Bangladesh, sit right at the edge of the protected area, a potential problem for the water quality and biodiversity of the area. The forest may also be under stress from environmental disturbance occurring thousands of kilometers away, such as deforestation in the Himalaya Mountains far to the north. To date, the Sundarbans has been a good example of how ecosystems can be protected and sustainably used by the people who live there. For example, the region is home to a network of tiger preserves in which populations of the Bengal tiger appear to have grown in the past few decades (monitoring is difficult in the swampy, densely forested terrain). However, human population in India and Bangladesh is growing far more rapidly, and the growth will likely intensify the pressure on the area and increase the challenge of maintaining a biologically diverse and healthy ecosystem. 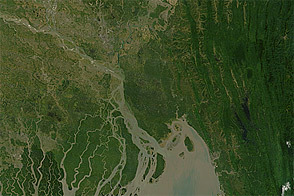 Wider-area image of the Mouths of the Ganges, from the Moderate Resolution Imaging Spectroradiometer (MODIS) on NASA’s Terra satellite. United Nations Environment Programme. (2005). One Planet, Many People: Atlas of Our Changing Environment. 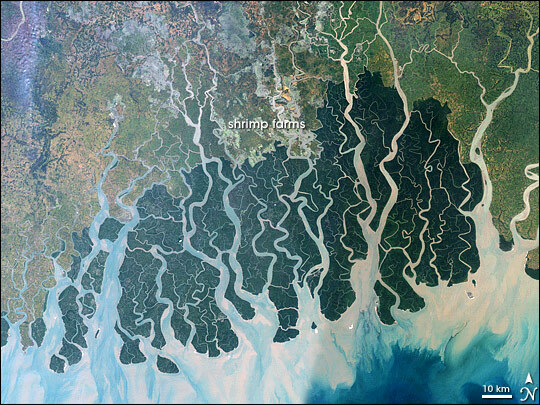 Sundarbans National Park, from the United Nations Environment Programme World Conservation Monitoring Centre.